This race attracts the greatest long distance runners in the world competing to win thousands of dollars in prize money. It is said to be the highest purse of any non-marathon race. Tremendous spectator support, entertainment and post party. Come and try to conquer this challenging course along with over 15,000 other participants, as you "Run With The Best." In 1975 the first Bix 7 race marked the largest gathering of runners to date in the Quad-Cities -- 84. It was also the first time runners were allowed to run on city streets. 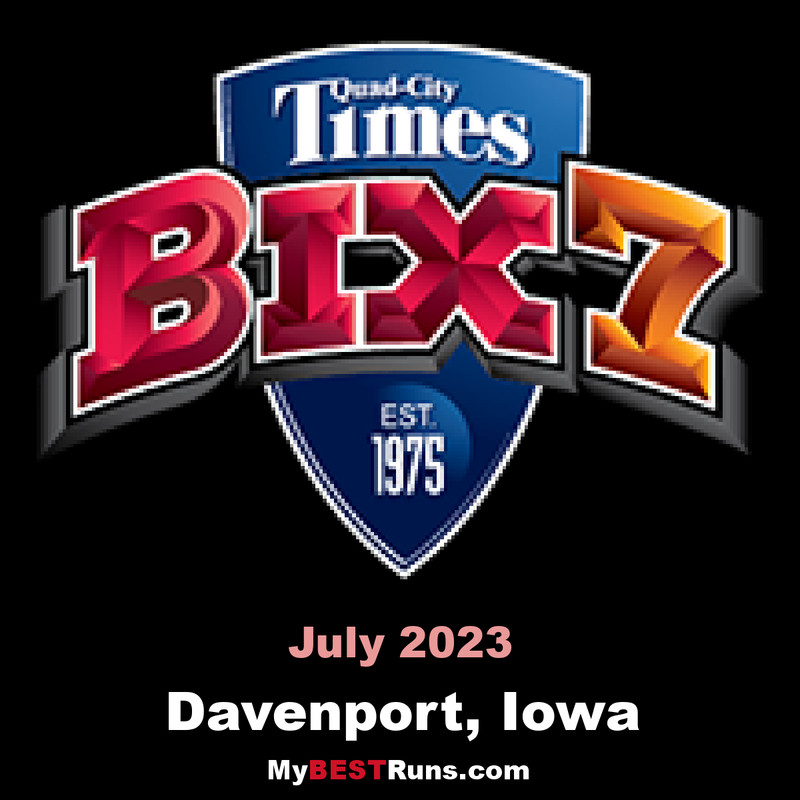 The Bix 7 was founded by John Hudetz of Bettendorf, who wanted to bring to the Quad-Cities some of the excitement he felt when he ran his first Boston Marathon in 1974. The race matched a pair of world-class runners -- Steve Hoag of Minneapolis, who finished second behind Rodgers in the 1975 Boston Marathon, and Lucian Rosa of Sri Lanka. Rosa, who later became the track coach at the University of Wisconsin-Parkside, won in a time of 34:33.8. There were only three female entries, led by Parkside student Kim Merritt of Racine, Wis. Her winning time of 41:04 was 24 minutes better than her nearest pursuer. It is a 7 mile out and back race on the Davenport hills, with alot of fan support along the way. Bands and music are scattered thoughout the course. The post race party is large and includes a costumes contest. It takes a few first-timers, people who never have been exposed to the Bix 7, to remind us. Like Jonathan Grey. He’s a veteran of the road racing circuit. He’s been to most of the big races. His first Bix 7 left him just a little bit wide-eyed. “It’s a small town feel but a big-time race,’’ Grey said after finishing fourth in the 43rd annual Bix 7 on Saturday. ‘’You feel like everyone is so close. It’s just a fun race to be a part of. I love coming to these races. Grey wasn’t the only one who noticed how strongly supported the race is by the local community. Sam Chelanga, who won the men’s race Saturday, said the thing he will always remember about his maiden Bix is the way the fans constantly encouraged the runners every step of the way. He said that just doesn’t happen in most races. Bix 7– Starts on Brady St., turns right onto Kirkwood Blvd., turns up Jersey Ridge Rd., turns right onto Middle Rd., and turns right onto McClellan Blvd., to a turnaround at River Drive. The course follows back the same way, turns left onto 3rd street to the finish line. QuickBix– Starts on Brady St (with Bix 7 runners), turns right on 15th St., turns right onto Perry St., turns left onto 4th St. to the finish line.